The King of high ISO performance is the EOS-1D X camera. You can read my article here. For those who may not need or cannot afford a professional camera, the EOS-6D can be a good choice. "The high ISO capabilities of the Canon 6D are remarkable. I can see myself regularly shooting at ISO 12,800 when needed. With this body it is plausible to shoot with an f/4 lens! I wouldn't recommend that necessarily, but if you already have f/4 lenses and are looking to get into night photography for a very affordable price...this is your answer. The colors produced by the 6D are consistently better to my eye. 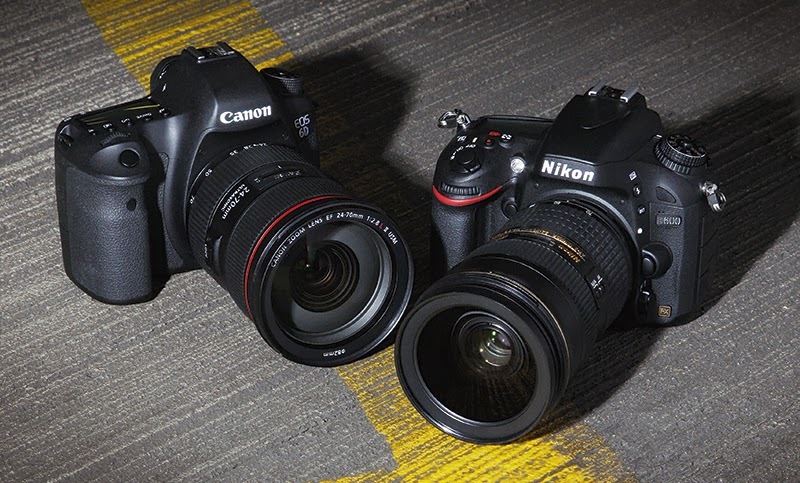 If you're devoted to Nikon, the D600 is no slouch. You likely shouldn't trade away all your gear to switch. This test is intended to compare the high ISO capabilities of these cameras specifically for dark sky night photography. The Nikon D600 has been superseded by the D610. The sensor is the same, they just fixed the oil spot problem. All images were taken with a Rokinon 14mm f/2.8. I used a Novoflex adapter on the Canon to attach the Nikon mount lens. You will see the stars are slightly softer on the Canon, this is likely due to the adapter changing the focus slightly, but has no bearing on this test. Pay attention to noise and colors. I started at ISO 6400. The images have no adjustments applied, except white balance (I used my unique method of setting white balance). Below you can see the D600 has a bit more of a green cast in the sky than the 6D, if I go too far to the magenta side on tint the sky becomes too purple and unnatural. Of course this can be fixed with a bit of work, but I prefer spending less time in post myself. You can also see how the little bit of light pollution on the horizon is enhanced in the Nikon, I prefer the more balanced sky the Canon provides." "Below is a 100% crop of the Andromeda galaxy. 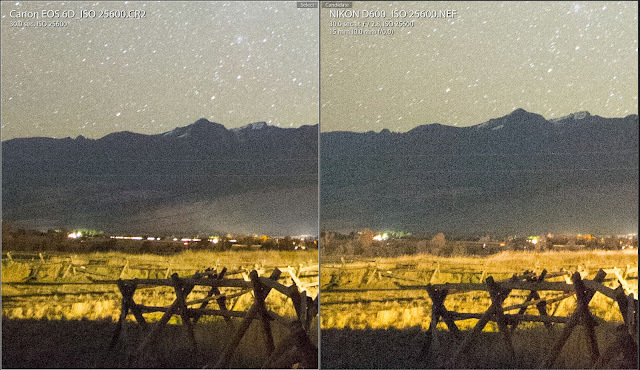 Here you can clearly see less noise on the 6D, as expected they are not significantly different. But the 6D does have the clear advantage." "Next we look at the shadow areas, to me this is the most important for night landscapes. The foreground is extremely underexposed, causing significant noise. Again, the 6D has a significant advantage." "In the next image I pushed the Shadows adjustment to +100 in Lightroom to see what detail could be pulled from the shadows, which I often do myself. Now the 6D starts walking away from the D600. But wait, the dynamic range on the D600 is supposed to be light years ahead of the 6D? An important thing to keep in mind when looking at dynamic range numbers is that they test at ISO 100, this has no translation to ISO 6400. 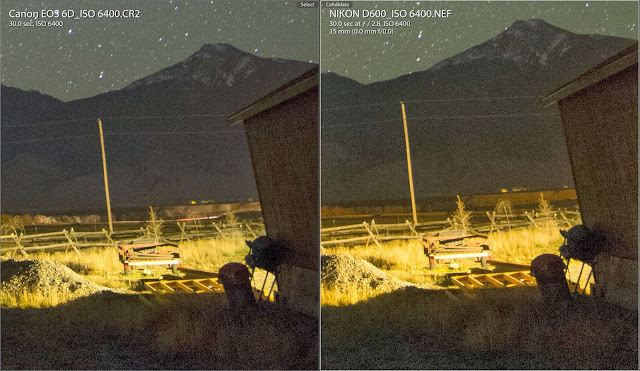 So yes, the D600 will be better at ISO's up to 400 or so, but after that the 6D is king. Time to push these cameras a bit farther, ISO 12,800 now. This is considered out of spec on the Nikon and is called H1. The image out of the D600 is getting questionable, it may be usable in some situations, but I would avoid using this ISO. The 6D is still looking quite clean though." "Now up to ISO 25,600. 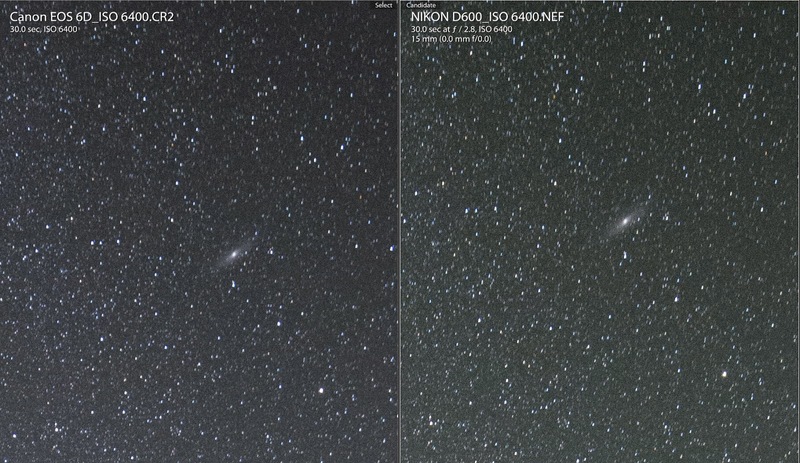 This is the highest in spec ISO for the 6D and the highest you can possibly go on the D600 (H2). 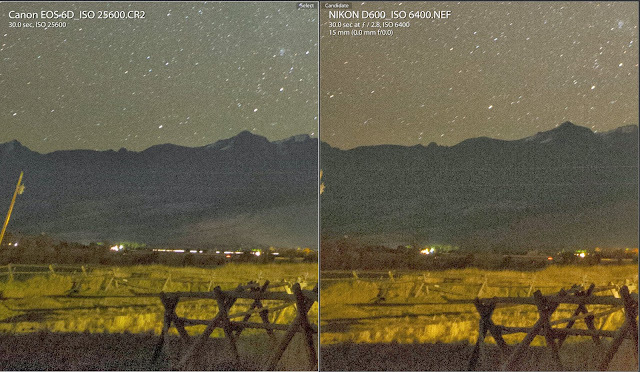 The D600's image is unusable at this point. 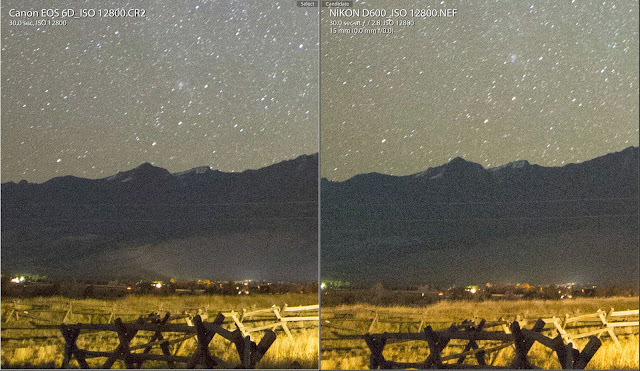 But the 6D is looking similar to what the D600 was at 12,800, potentially usable still." 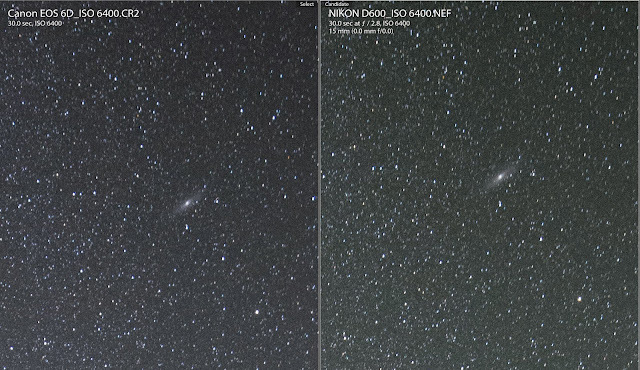 "In the last image I took a shot from D600 at ISO 6400 and a shot from the 6D at 25,600 and dropped the exposure of the 6D's image by 2 stops to see how much better the 6D really is. As you can see the images are very close. 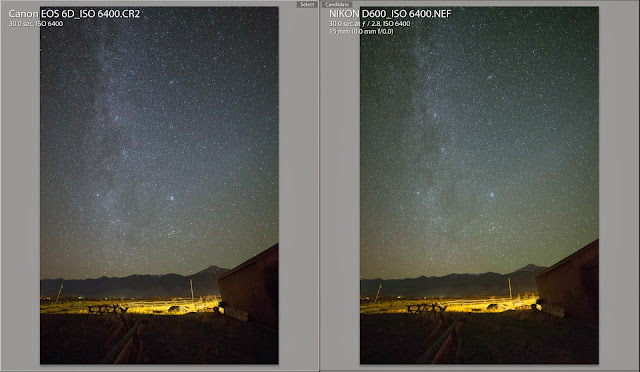 I would say the 6D has about a 1.5 stop advantage over the D600."